Sunday was a day for drum beats and celebrations for the Engineers at Sano. They beat Alpha Q in one of the most thrilling matches of all times and secured their place for the title clash with the mighty Samurai. The magnitude of the heist that the Engineers have pulled off is the stuff of legends. In a performance that simply beggars belief, a score line that read 4/41 after 10 overs read 196/6 after 38 overs throwing the jubilant Engineers into a frenzy of noisy celebrations and a cacophony of vuvuzela and trumpet. The chief architect of this show was involved in a similar heist that the Engineers pulled off a few years ago against the Indian Tigers at Shizuoka. Chasing a little over 200 runs on that occasion, the Engineers were 5 wickets down with 50 odd runs on the board but two brave men, Sidde Raju and Anurag Singh pulled off an incredible win with 150+ runs partnership that left the opposition stunned. It had taken the Tigers more than two seasons to recover from that loss. Here it was again, one of those guys, Anurag Singh, probably a bit wiser and smarter, again involved in yet another legendary stuff. 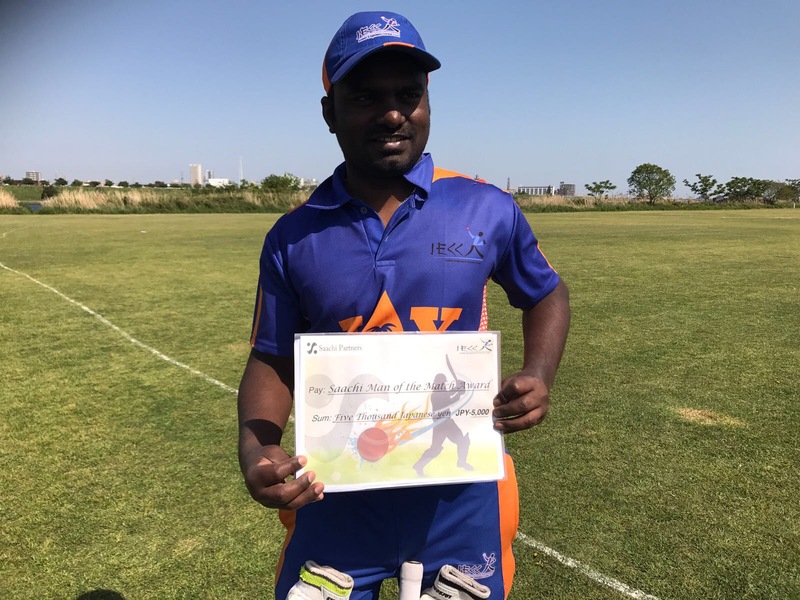 His unbeaten 46 along with a run a ball 47 not out by Manvi Prashant formed the backbone of the riveting thriller along with the flawless ensemble performance of the supporting cast, Sumon and veteran Ashok Kumar. The only aberration was the Old Monk that played its part on Anurag. After a night of drinks and who knows what else, with his neighbour and team mate, Charan Sidhu, and then an excellent spell of 7 overs for a purchase of 2 wickets, that included 2 maiden overs in the morning, the young man’s muscle struck work for a while during his stay at the crease, probably robing him of his half century. The Engineers now meet Samurai whom they have beat with ease at the league level. 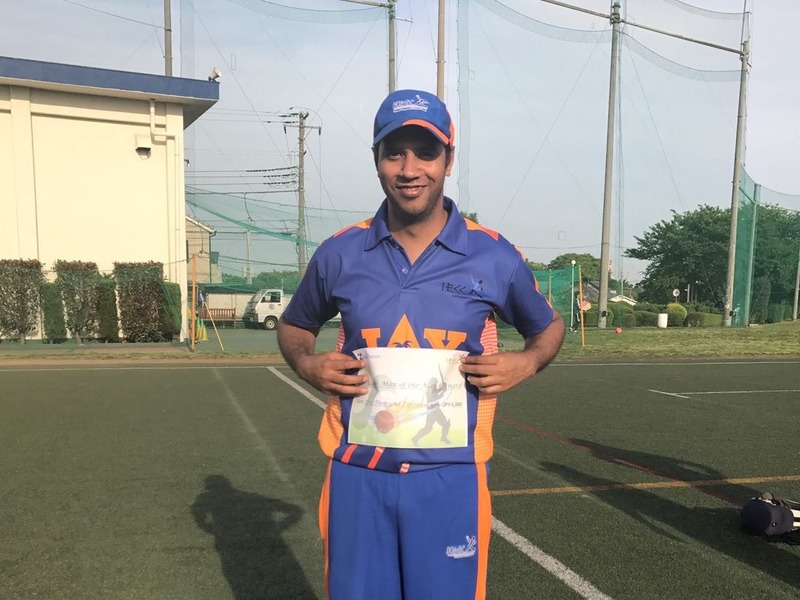 Samurai probably is also on a high after they chased down a target of 153 with ridiculous ease in 15 overs with their star batsman Hanif Niazi scoring 93 off only 45 balls in the first semi-final against the Indian Tigers. Earlier in the morning, electing to bat first after winning the toss Alpha Q progressed steadily. 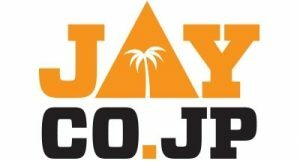 Engineers in their new jersey, sponsored by Jay Enterprises (www.jay.co.jp)were a bunch of happy and bubbly crew. Rajneesh and Biju opened the bowling for the Engineers. Rajneesh was as always McGrath-like miserly. Though both bowlers beat the bat several times, the openers Nilesh and Chandru progressed steadily. Nilesh looked more assured of the two and Chandru seemed to be playing a supporting role but in the end it was Chandru who top scored for his team and earned the SIDO Man of the Match award for AQ. Nilesh tried to play attacking shots and was successful on two occasions to send the ball to the boundary during his brief stay. He paid the price in the 7th over, slashing a ball to the waiting hands of first slip off Rajneesh. Score 24/1 after 7 overs. Anurag and Manvi were brought in as the change bowlers. The first over of both the bowlers must have given the batsmen a bit of confidence as they scored 19 runs off next two overs. But as the bowlers settled in, it became apparent that it was not easy as it seemed. Chandru and new batsman Vasant played sensible cricket to stay at the wicket and produced a valuable 54 runs partnership. Searching for a wicket, skipper brought in PK and he produced a result immediately. After being hitting for a four, which was followed by a wide, PK produced an edge off Vasant into the waiting hands of slightly widely placed first slip where Dinesh Singh took his second catch. Meanwhile, Chandru grew in confidence and was looking more like an opener who could play shots. He hit Manvi for a six and a four and started playing confident shots. New batsman Narendar gave him support and the pair put up another good partnership of 38 runs for the 2nd wicket. The partnership ended when Narendar was caught at the long on boundary by Rajneesh as the batsman tried to clear the ropes off skipper Vinay. Next batsman Krishna didn’t last long either and was caught at long off boundary by Anurag, who didn’t have to move an inch from where he was placed. In between Dinesh accounted for opener Chandru who was caught at the wicket for a personal score of 40. The score read 122/5 after 26 overs. With three quick wickets, the momentum was brought back and Engineers estimated that Alpha Q could be restricted to around 180 runs. Next in was the big hitting Nanda. The ever smiling batsman played some handsome shots but many a times was tempted by Vinay. He jumped out of the crease a few times only to miss the ball but escaped being stumped. The batsman’s overconfidence, however, led to his own peril. His sardonic comment “stop me if you can” sounded more like a verbal than a statement of confidence. The comment obviously spurred the engineers. In order to state his case, he played one shot too many but a searing delivery from Anurag sent his off stump cart wheeling. A send off comment “sometimes words can bite you back” was heard as the dejected batsman walked back for a personal score of 37. But by then he had taken his team to a respectable score of 183/7 in 37 overs. His partnership with Mohan yielded 35 runs for the 6th wicket. Mohan’s 16 came off only 11 balls but he also could not withstand the pace of the Old Monk lover. Some of his deliveries just seared off the surface as if they came off a spring. Engineers wrapped up things pretty soon thereafter, with AQ score reading 195/9 after Dhinesh Kumar dispatched Manvi to the boundary off the last ball of the innings. A delicious chicken curry lunch prepared by PK provided the spice required for the chase but the drama was yet to unfold. Engineers always knew that it would be AQ’s batting vs. Engineers’ batting. So skipper Vinay Iyer and Bidyut Sarkar went out determined to see AQ’s opening bowlers Mani and Nanda through. Mani generated good pace and kept a consistent line. His hard work was rewarded when Bidyut played on to his stumps in the 3rd over. Score 4/1. With a pretty decent batting lineup with big names like Dinesh Singh and Prashant Kale yet to come, an early wicket normally does not cause a big problem. Mani, however, persisted with him immaculate line and length and he was rewarded again in his very next over. A searing beauty outside the off stump took the edge of Dinesh’s new bat on its way to the ‘keeper’s gloves. Engineers 10/2 after 5 overs. Now, that is a cause of a slight concern. In came Prashant Kale, due for a big innings the whole season. He produced his trade mark flick that fetched the maximum in the 3rd ball he faced off Mani. Things looked a bit better and batsman gained some confidence but the AQ bowlers still kept the runs dry. As the score read 30/2 after 7 overs, Prashant tried to ease the pressure by hoicking the change bowler Mohan. Although two fielders converged from far ends the ball landed safely in no man’s area in the mid wicket region. That was an aah.. moment for the Engineers. Mohan continued to keep the Engineers under pressure. His hard work seemed to have fetched results when he trapped skipper Vinay in front. As the ball seemed to have hit the pad the fielders went up in unison and up went the finger any batsman dread to see. The batsman walked back after exchanging his views on the decision as he had played the ball on to his pad. Score 31/3 after 7.2 overs. All these seemed to have affected Prashant who normally keeps his calm. A few balls later he tried to shake off the shackles once again by lifting Mohan again to the same region where he was dropped earlier but his luck had run out by this time. Score read 41/4 after 10 overs. The celebration of the AQ said it all. They thought they had the game. Their nostrils had filled with the scent of victory as that scoreline is most times a harbinger of a jolly good trouncing. Now, the Engineers had a situation. It was a familiar situation. But this was no league match. This is a prestigious match. This is the knock out of KCL. They have gone through this pain 5 times before. The trophy suddenly seemed to be ever elusive. Though there was no Situation Room to address the situation two brave men at the crease handled the situation very well – again. One was the Old Monk lover and the other was the diminutive little master, Sumon. Both played cricket like it has to be played. They respected good balls, punished the bad ones, ran quick singles where there seemed none, converted singles to twos. Sumon took 10 balls to open his account but he did it in style by dispatching two consecutive balls to the boundary. He took another 8 balls before playing his next scoring shot. He knew what was to be done. He knew how it was to be done. He had Anurag at the other end who kept the scoreboard ticking with singles and twos. Engineers heaved a sigh of relief as the score reached 100 in the 20th over. Alpha Q was 101/2 at this stage. Game evenly poised. Soon after the drinks break, Nilesh broke the partnership when he clean bowled Sumon for a personal score of 27 but his immensely valuable partnership of 67 runs with Anurag had taken the Engineers to a stage where they could stay alive in the game. Score 108/5 after 22 overs. Dignity was restored and an attack could be planned. In came the Sehwag of the Engineers, Manvi. His simple Sehwag-like philosophy of “if the ball there to be hit, hit it” had cost him big scores many times in the past but he has always provided the team with the impetus it needed. This writer has implored the batsman many times to develop a bit more patience to play longer innings. The potential is huge but the patience, or the lack thereof, most times never allowed the maverick batsman to fully realise it. Here was a situation where the team needed best and most of these two guys and boy, did they live up to the expectation! The two men played the innings of their life to the total discomfort of AQ. Bowlers steamed in, doing their best to dislodge the partnership but they took the bowling by the scruff of the neck and shepherded the side well. 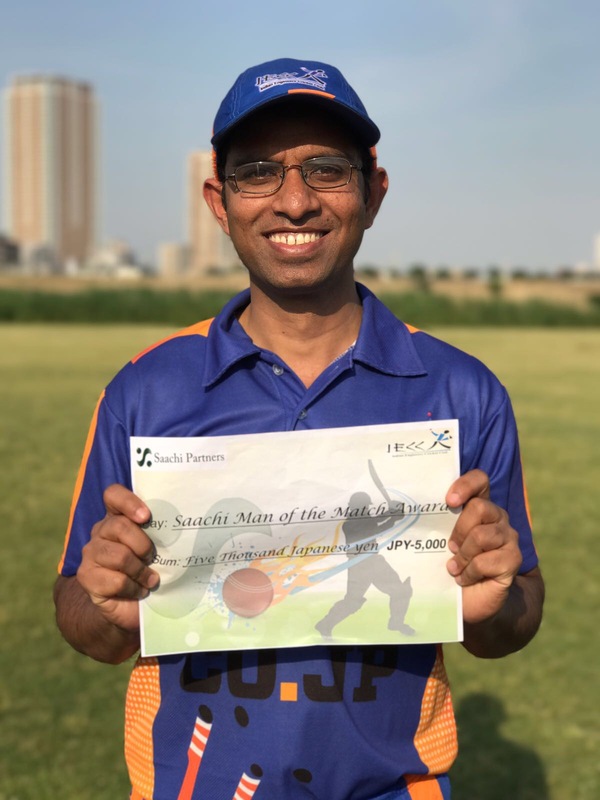 When Anurag was forced to take a break to nurse his muscle at his personal score of 26 in the 23rd over veteran Ashok Kumar replaced him to give company to Manvi who had changed gears to top by that time. Ashok played with ease and calm, not seen of him in the recent past, to score 14 runs but a series of dot balls caused the batsman to play shots to break the shackles only to give a catch at mid wicket. Score 163/6 after 34 overs. The match was still evenly poised but the return of Anurag to the crease to join Manvi restored the calm. The nimble footwork and silken timing of both had the poise and elegance of finest of players you could see in Japan. AQ skipper Srinivas tried all the tricks in the hat, brought his primary bowlers back but after withstanding probing spells from the bowlers, Anurag and Manvi teed off with élan once their spell was over. The rest was all clean hitting, too clean for AQ’s comfort. With almost identical scores it was only natural that the number of big scoring shots were also the same. Both batsmen had four hits each to the boundary and one each over it. Very well played Alpha Q. It was a great match and we thoroughly enjoyed the intensity and sportsmanship. Glad to know that Vasant has no internal injury!